Courtesy of Hassan Baraka, HB Sport, Morocco. Ram Barkai announced the first ice swimming event in North Africa. "The International Ice Swimming Association is excited about the positional expansion of the sport to Morocco. The IISA is supporting Hassan Baraka and HB Sport Consulting in their quest to promote Ice Swimming in Morocco and hold the first Ice Swimming event in Morocco. IISA will hold its 3rd World Championship in March 2019 and its aspiration is to be included in the Winter Olympic Games as a competitive sport." The Ice Swimming Event will be held in Morocco on February 17th - 18th 2018. Baraka explains, "We also want to make this event more than a simple day race, but a trip in order to discover the beautiful landscapes of Morocco. 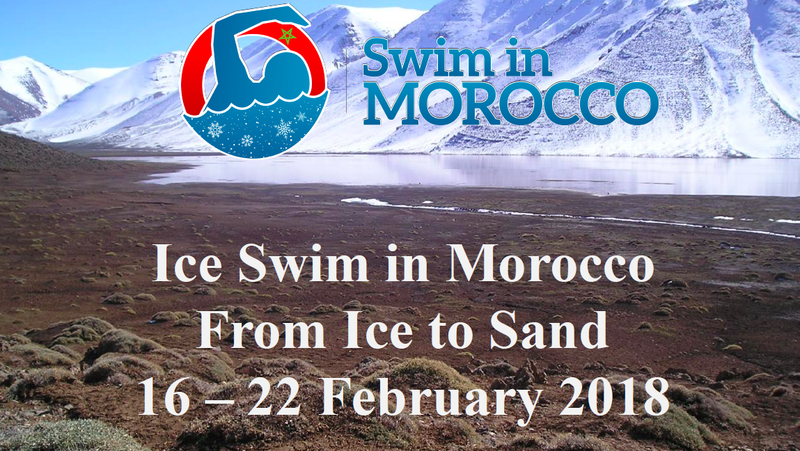 The idea of the event is to go from 'Ice to Sand', the participants will go from swimming in the beautiful lake chosen on the Atlas mountain to the Moroccan desert. It will also be an occasion to visit the beautiful city of Fes, walking in the old medina is like being in the 16th century and other unique places of the country." The ice swimming event will be held in Aguelmim Azegueza that is located at 1,470 meters in altitude, surrounded by magnificent cedar forest. "You will have the possibility to do an Ice Mile for the Ice Sevens Challenge, certified by the Ice Swimming Association. Distances include the 50m breaststroke and 50m, 100m, 200m, 500m freestyle. A 1 km freestyle race will be organized for swimmers who are confirmed to have swum the distance over the last year. All the swims will conducted under IISA rules and safety. The water temperature will depend on the weather, but we expect water temperatures under 5°C. The competition will be filmed and a personalized video of the event will be sent to the participants on request." The price per person for the 7-day trip is 1630€. Contact Iktichaf Travel at contact@iktichaftravel.com for booking inquiries. For swim-related questions, contact HB Sport at contact@hassanbaraka.com.